Royal Oak Transcript — From an interview with Kevin Seabrook on Sunday, September 7, 2014. 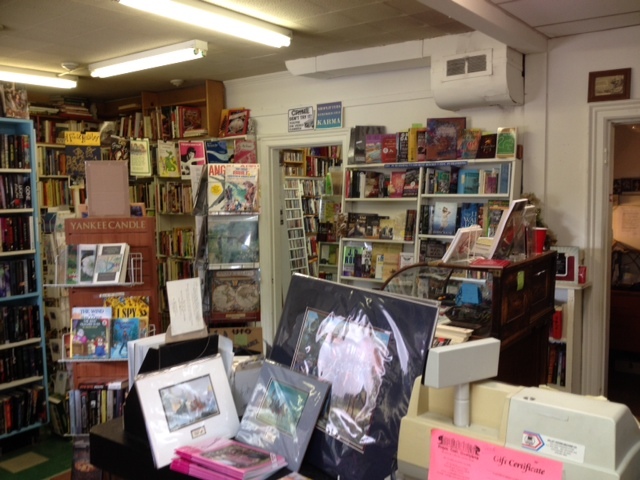 If you are in the Shenandoah Valley of Virginia and love books, you must visit this venerable shop. It has a wide selection and a wonderfully comfortable and friendly environment in which to browse. Visit the shop online here. TT – Can you give me a brief history of the shop? KS – Nan Hathaway established it in 1975, originally selling books and games, but then gradually found that the books were selling better. She found that used books had a better [profit] margin. 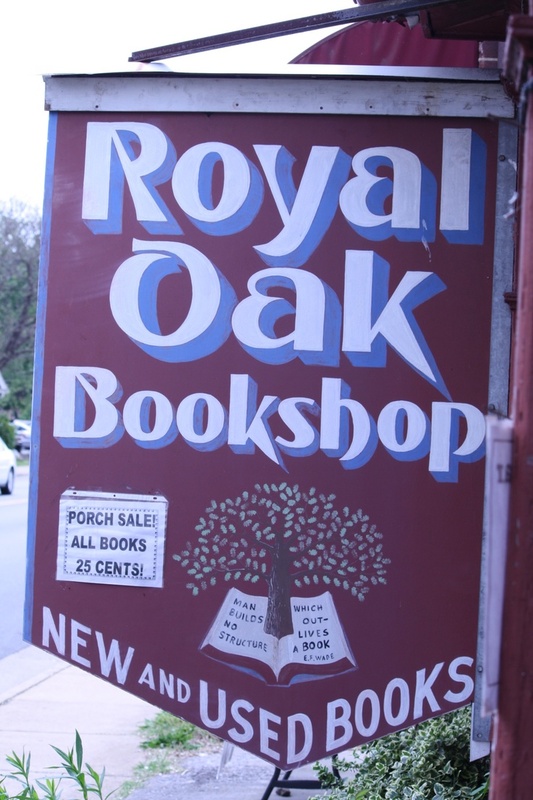 There’s a history of the bookshop at Royal Oak Bookshop.com. I can’t remember the year she bought the building next door. That had originally been a butcher shop. TT – And you bought directly from Nan? KS – Nan hit 65 and decided she’d had enough, and wanted to find someone who was interested in keeping it going. We had a number of conversations, and she consented to sell us the bookshop. At that time I was still working for the newspaper. TT – This is the Warren Sentinel? KS- Yeah, The Warren Sentinel. I was looking for something less stressful to do. So, in 2008 I quit the newspaper and worked here for a couple of years. Then we decided to buy the building, so I went back to work. KS – Right. (laughter) Our rent payments now became our mortgage payments. She was able to owner finance. TT- Which helped Nan out as well. TT – So what is your personal connection to books, writing, and publishing? KS – My mother is Brenda Seabrook. She’s a children’s book author. She published her first book in 78, and her most recent one was in 2008. And she’s written more than twenty, ranging from child picture books on up to teenage novels. We sell them here in the shop. I majored in journalism at the University of Georgia, and I transferred out and ended up getting a degree in English. Went to New York, where I worked in publishing for ten years. I’ve always been a reader. I worked in bookstores. I worked in Oxford Books, which was a huge bookstore in Atlanta. It was in an old car dealer’s store. The periodicals were in the round showroom. In about 96 a B&N opened about a mile away then a Borders opened a mile away then put them (Oxford) out of business. TT- What excites you the most about having a bookshop? KS – Being around book people. Judy, who used to own a bookstore across the way– Pagemaster—you know, when I was buying this place, used to say book people are great. Nobody ever comes storming back into the shop and slams down the book and says, “I’m so angry that you sold me this book! I’m so mad at you.” You know because at a newspaper that does happen. You get yelled at for what you did cover. You get yelled at for what you didn’t cover (laughter). So the people are really fantastic. And people are interested in something that you’re interested in. TT – How about struggles? What’s the most difficult aspect of having a bookshop? KS- If we could get people in the door, they almost always find something. It’s a struggle when you have two feet of snow. Like in 2010 we were closed for a week, and that’s revenue we’ll never see. As long as the forecast says it’s going to be rainy, we don’t get the folks from Northern Virginia. We have wonderful customers here, and we love them. But we really can’t make it without the people from Northern Virginia. TT- So that’s the bricks and mortar aspects of it. Is your online business okay? KS – Yeah. It’s had its ups and downs. With the shutdowns and people being furloughed, people have ordered fewer books online because their worried about their next paycheck. But it’s been up again in the last few months. That helps us keep the bricks and mortar open. TT – Does the bookstore have any ties directly or indirectly to education, such as the public schools? KS – Well, we partner with the library every year for a holiday writing contest, and we’ve sponsored that for twenty-eight years. We help hand out the awards and give gift certificates. We certainly have had teachers come in here and order books and give them discounts. TT- To fulfill their class reading lists? KS- Right. And we’ve handled the sales for Ressie Jefferies, the elementary school here in town, we’ve handled the sales of their family book fair. We’re always willing to work with the schools if they ask us. And when teachers come in we offer them a discount. TT- What genres are selling really hot now? KS – Mystery, always. Romance, horror. A lot of people come in looking for history. But definitely mystery. TT – What would you say the store’s strength is? KS – The Civil War has always been something we’ve been good with. Children’s books, books on Virginia. A lot of people come in here for trail maps and guide books for the park. We sell a fair number of maps. We do sell some new bestsellers. TT – What advice would you give someone who is interested in starting a bookshop? KS – You’ve got to like people, and you’ve got to love books. It’s not like selling widgits. Books are a specialized item. It’s not enough to read a lot. It’s a business. You have to have some capital so that the rent isn’t going to break you. You’ve got to have a passion for it. You’ve got to get the right location. Certainly one of the best things when we bought this bookstore was that it had been in business for so long. It’s a landmark. People know it. You’ve got to get stock, and for the most part the books come to us. It’s amazing how many books are out here in the Shenandoah Valley tucked away in people’s houses. It helps to be physically strong or have access to someone who is. Moving around boxes of books can be heavy work, and there’s a fair amount of that. 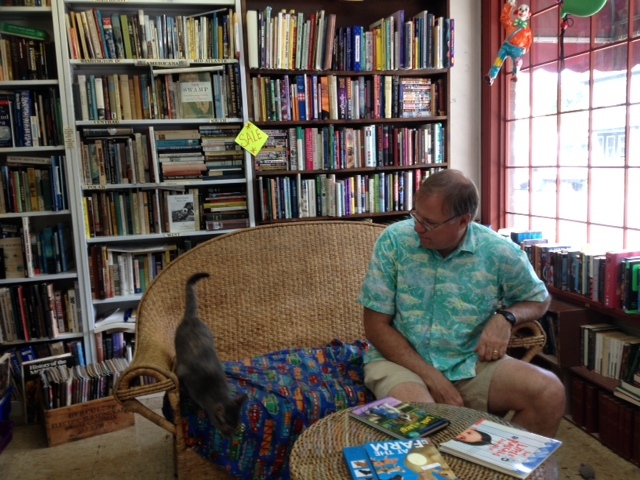 TT – So would you say that the presence of Harper (the cat) has been helpful for the bookstore? KS – Yeah. You know Huxley was here for nineteen years. 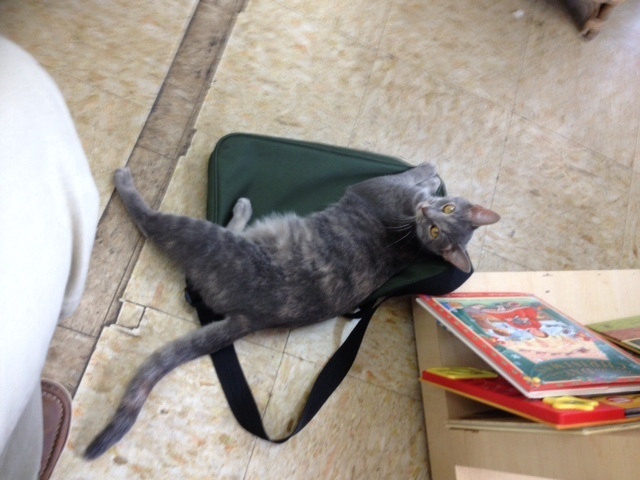 Willa Catter was here for ten years, and now Harper has been here a year. So, we have had thirty years of cats here. We have people who come in just to see the cat. They don’t buy anything (laughter). They just visit the cat. TT – Thank so much for your time Kevin. KS – Not at all. Thanks.